Surviving Twice is the story of five Vietnamese Amerasians born during the Vietnam War to American soldiers and Vietnamese mothers. Unfortunately, they were not among the few thousand Amerasian children who came to the United States before the war's end and grew up as Americans, speaking English and attending American schools. Unfortunately, due to sales rights restrictions, we cannot offer Surviving Twice for sale in your country. Surviving Twice is the story of five Vietnamese Amerasians born during the Vietnam War to American soldiers and Vietnamese mothers. Unfortunately, they were not among the few thousand Amerasian children who came to the United States before the war's end and grew up as Americans, speaking English and attending American schools. Instead, this group of Amerasians faced much more formidable obstacles, both in Vietnam and in their new home. 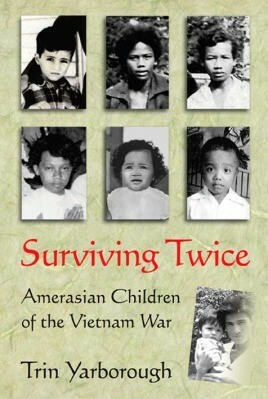 Surviving Twice raises significant questions about how mixed-race children born of wars and occupations are treated and the ways in which the shifting laws, policies, social attitudes, and bureaucratic red tape of two nations affect them their entire lives.